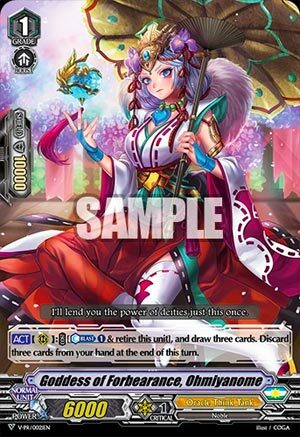 [ACT](RC):COST [Counter Blast (1) & retire this unit], and draw 3 cards. Discard 3 cards from your hand at the end of this turn. Yeah, see, you’d also need to run this to make Torte actually stick that pressure, and that’s annoying to some who don’t want to promo hunt. Apart from any build with Torte however, your sheer hard advantage would render this unneeded. No other deck wants card advantage you don’t actually keep for a cost.